If you live in an older home with glass windows or live in a climate that is susceptible to causing home damage, chances are you’ll need to replace your windows at some point. CK’s is here to help you with that! Whether you’re looking to decrease the draftiness in your home or if you’re wanting to be more eco-friendly, CK’s offers a large variety of replacement windows for you to choose from. With rising energy costs and concern for the environment, energy efficient windows are a key component in saving you money, while keeping your home bright and comfortable year round. We carry a full line of vinyl, aluminum, fiberglass, wood, and glass windows to help with all your window replacement upgrades. 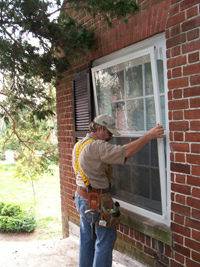 We also offer a wide variety of traditional glass replacement windows. AAMA (American Architectural Manufacturing Association) certified-Each of our installers is fully trained and AAMA certified. Several brands of windows available, such as Cascade and Alpine.